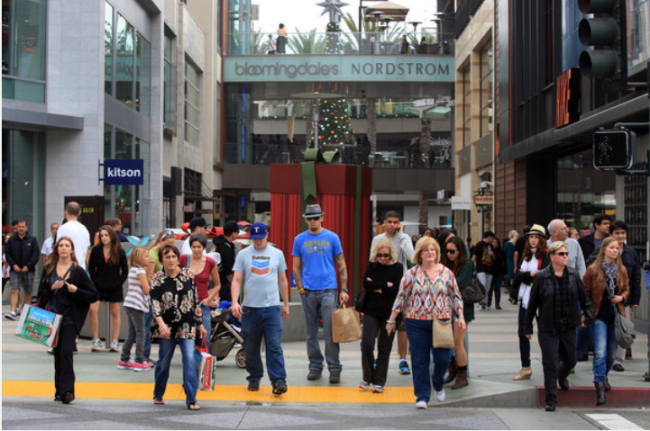 Make that, “On Dressing Not So Well.” Here is a picture from a mall in Santa Monica, first appearing in the Los Angeles Times. Tis always the season for looking poorly. Truly it was a black day, and not just because of the fights, riots, and nauseating avarice displayed by many shoppers. No. It was the visual assault that cast dark shadows. Let’s engage in some amateur photo reconnaissance. The location? A mall with top-end stores, meaning that to shop in them one has to have piles of the green stuff at arm’s reach. These are not poor people. Further proof: nobody looks like they’re going hungry. There are no beggars. The accoutrement of the mall—the tree, the giant present—are of superior quality. The buildings themselves are clean, sharp. So money isn’t a problem. What is? What first struck me were the two gentleman in the center. One is wearing what looks like a modified logo of an oil company and a hat advertising his preference in sports, which is evidently something he wished others to know about, the depth of his ardency so strong that he put it where everyone must see it. His neighbor wears a hipster hat and blue rumpled t-shirt on which is imprinted a message thankfully too small for us to read, but one which this man thought of such important that he should emblazon it on his chest. The blouse of the rightmost lady resembles one of those hidden art pictures which if stared at reveal a rocketship or a man riding a horse. The blouse of the other lady looks to be a smock, such as one might wear while casting pottery. There is no need to continue. Every person, without exception, looks terrible. No one picked something which fit his or her body. Everybody’s clothes are ugly, sad, unkempt. Everybody did their damnedest to appear like an unthinking high school sophomore. In this and only this did they succeed. The clothes are the visual equivalent of popular, which is to say, bad music. There is no pleasure to be had in looking at anybody. I notice here is a woman to the far right that seems fairly well dressed. The younger woman behind her is also dressed fashionably (which means not to your taste?). There’s the child with the hideous pink tennis shoes, at least two people in shorts, both of whom are wearing jackets (that’s a common look here in Wyoming, actually). I would note that only one person can be seen chatting on a cell phone, which is encouraging. This crowd is actually better dressed than what I see at the mall where I live. While these people are shopping at high end stores, it may be that they are just gifting to impress relatives rather than actually being the type to shop there all year round. The far-right woman’s jeans look about to tear at the knee. A good test is to put your thumb over the face, so that the prettiness or ugliness of the person doesn’t influence you. The guy in all black is wearing clothes at least one size too large. And yes to your question! Yes, yes, yes. I was going to make a (bad) joke about how one of the men was me, but the jeans are too baggy, even for myself. But if I dressed like I were rich, instead of dressing well, then I’d look like the people in the picture. Perhaps. I am not argueing with your point that they aren’t dressing well. I lived in Europe for awhile many years ago and dressing well was important to them. So important that they wanted everyone to dress well and would insult those who failed to live up to their standards. So I see this differently. That is, what I am seeing in this picture is freedom. They are free to dress as they like and can still go almost anywhere they want to in this country in T-shirts and Jeans. Briggs: These people look much better than any of those featured in the “Walmart Shoppers” emails that go around. I guess it’s a matter of comparison–to the well-dressed person, the people in the picture are dressed down. When compared to “Walmart shoppers”, they are very muchly over dressed. Unless you can afford full service custom tailoring, finding clothes that fit to your apparent standard is all but impossible for most people. Off the rack clothes are only going to fit a very small percentage of the population that well without at lease some alterations. If you can afford that, you probably wouldn’t be shopping at a mall, not even an up-scale mall. This is not so. I also cannot afford the best. And it’s not off-the-rack or ill fits per se that is ugly. But in the choice of clothes. I cannot fathom what motivates someone to spend $68 on an ugly ball cap. Ridiculously overpriced is an understatement. As my husband often asks, “Is that ugly or is it fashion”? Most people to-day look like unmade beds. It is evidence of the egalitarian poison of a degenerate culture. Too, for decades, now the wrong people have been having children (look at the physiognomies of the people you see in the street: do you expect such vile examples of humanity to have taste?). No matter where one goes now, one feels as if one had died and gone to hell. Thank you, Mr. Briggs, for your post. I have always been comfortable when dressed well and looking sharp, and I wonder if the discomfort so many feel when not allowed to wear jeans and a t-shirt everywhere they go is actually a discomfort with the way better clothing would give definition to their lives. It will take many years of deep psychotherapy to help at least a couple of generations part ways with their tastelessness, and to regain some pride in appearance. We have progressed to the point where such casual dress is now seen as well dressed — perhaps even overdressed. I do think this started in the 60’s and now “casual” is considered normal. In Wyoming, you often see bank tellers in jeans. Of course, you also see women in Carhart overalls driving a 4WD pickup in snow, get out carrying a dress and high heels. This casual certainly does detract from looking like an adult–I have often said my high school class was the last one that looked like adults in their senior pictures. In the photo, the guy in the blue t-shirt has tattoos down both arms. This is now mainstream–so mainstream in fact that it was reported that Pink (rock singer) said she would tell her daughter to skip the tattoos if she wanted to stand out from the crowd. Eventually, “casual” will be replaced by formal and we’ll look like adults again, with a large population of unemployed tattoo artists. Rather, we have regressed to the point where wearing anything clean and covering the shins or forearms is “formal.” People show up to funerals in shorts and t-shirts. As in art, architecture, music, literature we take our notes from the bottom and not the top. And we are all ugly. What’s worse is that people are frightened of dressing well. They don’t want to be see as claiming any kind of “superiority.” Even though it is not the well-dressed people who are superior, but that beauty is. Is that good or bad? Hopefully no worse than today. I’m sorry, but I usually wear the abomination of a button-down collar shirt and relax-fit jeans to the mall. Sorry, I’m still a kid at heart. The problem is that most clothes are made from knit cotton fabric. There is no way you can make tee shirt material look tailored. At you would think at some point, people would tire of wearing jeans. I have. The most radical thing a woman can do in this culture is wear a long skirt, preferably with a petticoat. Even if you cannot afford the *best* you can polish your shoes (if they aren’t tennis shoes) and press your shirt or blouse. You can shop sales (there is a rhythm to sales) and you can shop at thrift stores. Thrifting takes a tremendous amount of patience, but if you wait it out, you will find some terrific bargains. Maintenance is the key to sustaining one’s wardrobe. It doesn’t take a lot of skill to sew on buttons or put up a hem. If you are unsure or not confident, there is a youtube video for that. I find myself being amazed at what people will wear in public. It isn’t difficult to look better dressed than about 90% of people you might see while out on errands. I dress well relative to people around me but only occasionally truly dress well. The main drawback, as I see it, to always looking well dressed is that wool slacks must be cleaned and pressed. That requires the expense and time of a dry cleaning service. I polish my shoes with olive oil. It feeds and protects the leather. Of course they are a work/hiking kind of shoe/boot not a suit or chino kind of shoe. But they do go quite well with jeans. Not to be outdone, the snow will slide east into the Dakotasâ€¦.. This latest winter storm is due to a cold front plowing southeast through British Columbia, on a beeline to the Northwest. At the same time, the Pacific moisture is being squeezed out as a messy mixture of snow, sleet, and freezing rainâ€¦.. I wasn’t sure if I was reading a weather report or a novel. Dressing isn’t the only place society has reverted to adolescence or further back. Some years ago I worked as a Rehabilitation Counselor for the State of Nevada. One day, after a disagreement with my supervisor, I prayed for an answer. The message: “Wear a tie.” I did. I was kidded about it for 2 weeks but then continued. Within 2 months I received an EXCELLENT rating as an employee. I continued. I became the director of a state program. I continued. I noticed that most everyone, even in a 7-11 treated me well. I continued, and I continue. Fr Bill, same thing happens wherever I go. Need fast, courteous service renting a car at the airport? Dress well and include a tie. Matter of fact, want to find favor anywhere at any time? Dress well and include a tie. The clothes make the man. The clothes do make the man. Having just taken a walk on campus, I see the weather in the picture was nice enough to generously allow people to wear shirts, shorts, skirts, long sleeves, and leather jackets. I think this world is big enough for all kinds of people dressed in various ways, even if our heart is not. Who are we to criticize why people are wearing what? Maybe this Advent would be a good time to take up that still-relevant-even-if-old-fashioned practice of custody of the eyes and implement in into our lives hereafter. I’d like to be so busy thinking about other, more uplifting things that I wouldn’t really notice the attire of people around me. You must bump into things a lot. All comments belong here. We are a menagerie. Thanks, Briggs! LOL! In that case, I’ll hang around!